While I was nursing Mason, Parker was on the other side of the bed messing with the video monitor on the nightstand. I told him No, and he continued to play with it. Then I told him that if he did it again that he would go in time out. So he picked it up, pressed a few more buttons, then happily walked over and put himself in time out. 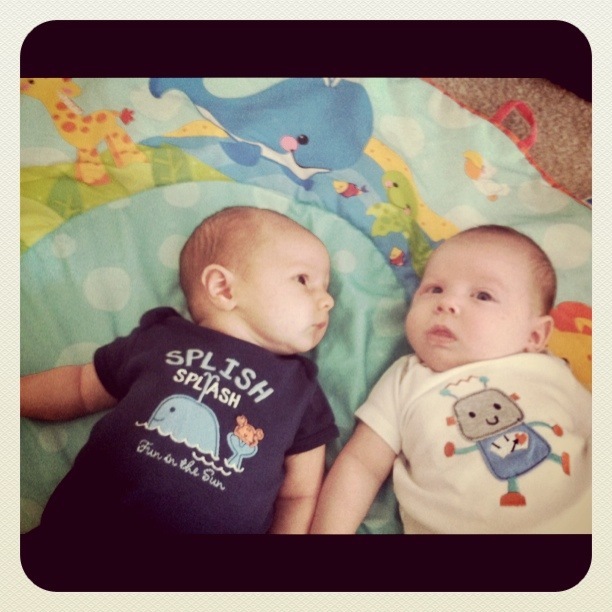 Mason went for his first playdate with a little guy his age. His new buddy Aidan is two weeks older than him. After giving him a “look” as if to introduce himself, Aidan proceeded to sneeze right in his face. During snack time, Parker and I split an orange. He thought it was so yummy. So much so, that he just couldn’t understand why the orange peel wasn’t edible, and decided to throw himself on the floor in a fit of frustration because I wouldn’t let him eat it. We were in Mason’s room, waking him up, dressing and feeding him. 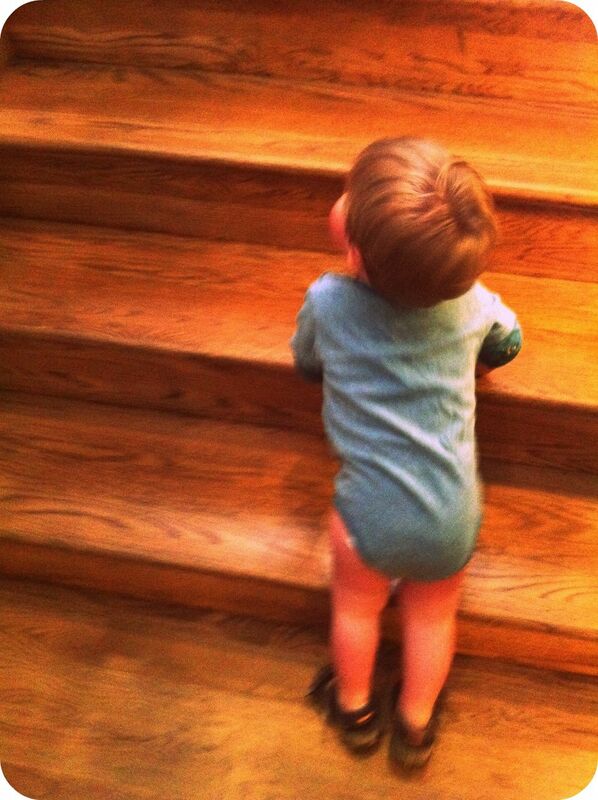 I asked Parker if he wanted to go say “Good Morning” to Mason. 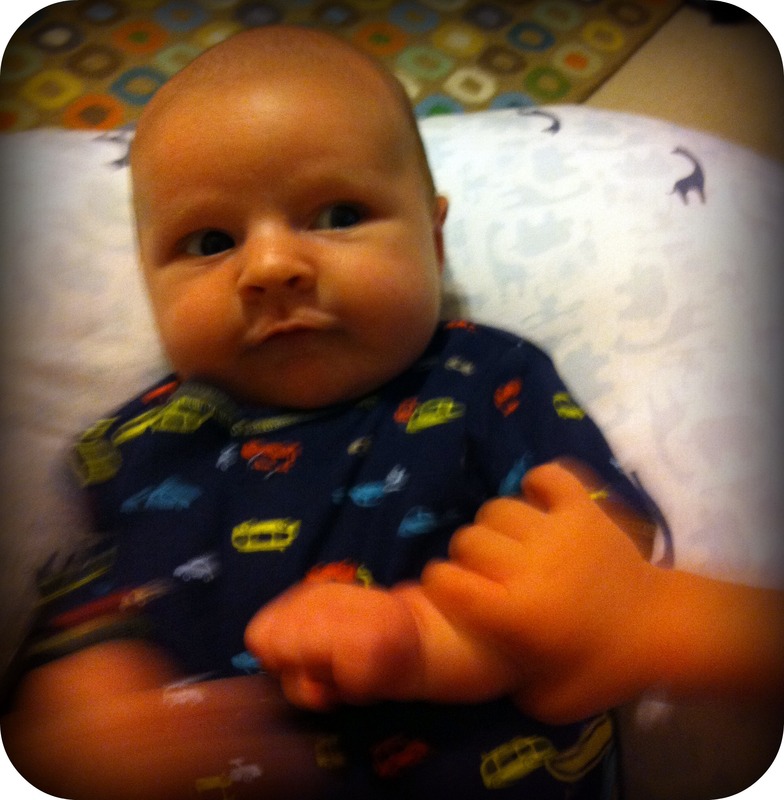 So, he came over, gave him a big kiss, and grabbed his hands and started doing “patty cake”. Mason started to have his first grin! After a nice stroller walk through Dahlonega with the boys, we were ready for a nice dinner at the Smith House. We went to the car to drop off the stroller before heading in, and realized that Parker had emptied his entire sippy cup in his lap. So, Parker went pantless to dinner. After a nursing session in the middle of the night, sleepy from exhaustion, I very carefully began to undress Mason to change his diaper. Soon after, proud that I didn’t manage to wake him in the process, I swaddled him snug and placed him in his crib. As I go to turn the handle of the door to leave, careful not to make a peep…it happened- the sound of a newborn poop explosion. 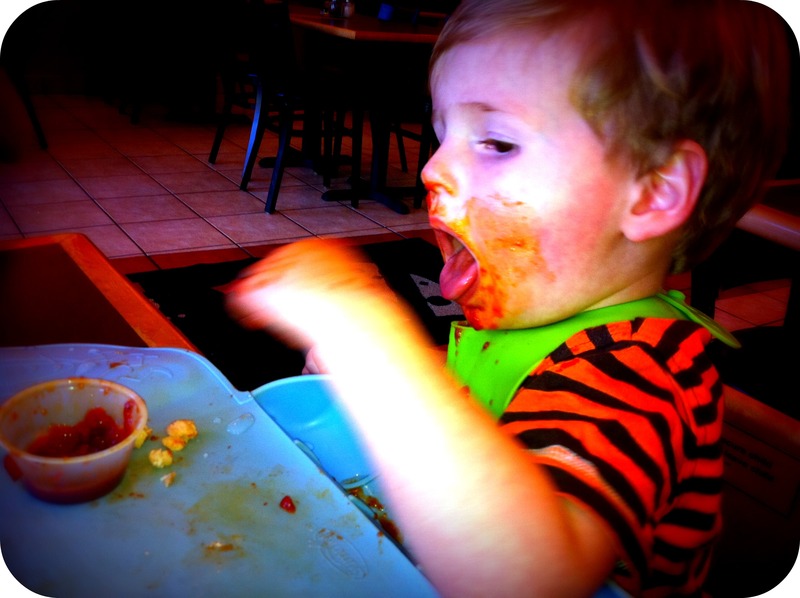 Parker is obsessed with dipping food. So, when we were at Zpizza the other night, and he had finished dipping all of his pizza in marinara sauce, he started to shovel in the marinara by the fist full. 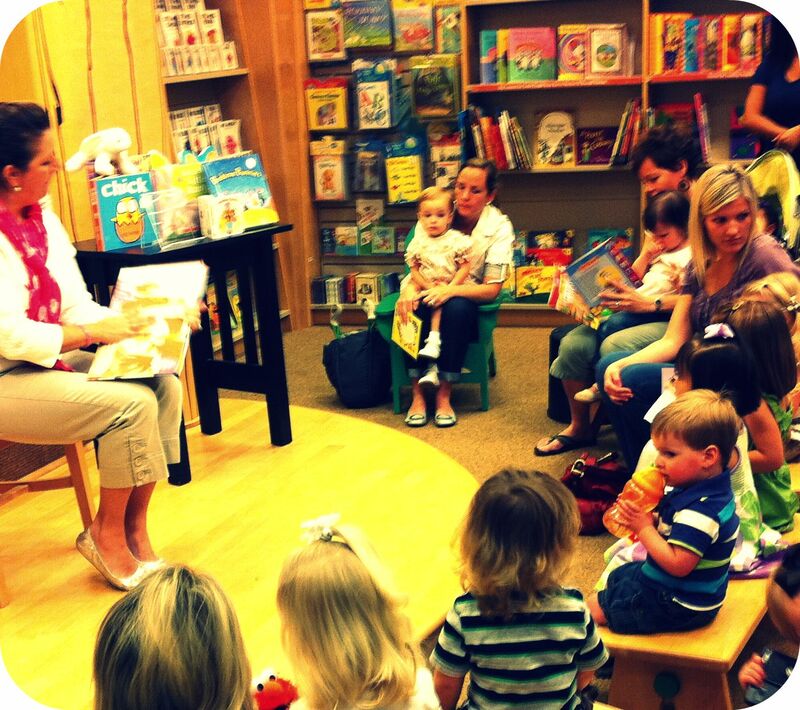 Parker had his first story time at Barnes and Noble hearing about “Chicks and Bunnies”. He did really well for the first ten minutes or so. Even waving to a few cute girls that sat near him. Then all of a sudden he started making this loud grunt noise as if he needed to poop. Soon after, he tried to walk on stage and I had to come get him. That’s when the his evil twin emerged. And… we all live to see another day. awww…. i love all the stories! These are the stories you’ll find yourself telling over and over again as the boys grow older. I love it!